Graded Response Action Plan (GRAP) to control air pollution has been implemented in the Delhi-NCR region by the Environment Pollution (Prevention and Control) Authority (EPCA). Under the plan, prepared in 2017 on the directive of the Supreme Court after high pollution levels in the National Capital Region in 2016, graded measures are implemented based on the air quality of the city. The SC-empowered EPCA is mandated to take steps to tackle air pollution in Delhi-NCR. When the quality of air is between "moderate and poor", the measures to be taken include a ban on garbage burning in landfills, enforcing all pollution-control regulations in brick kilns and industries, and in thermal power plants. There is a periodic mechanised sweeping of roads with heavy traffic and water sprinkling on unpaved roads every two days. 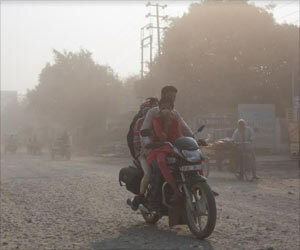 Rules are to be enforced for dust control in construction activities, and it is ensured that only trucks registered after 2005 are allowed entry into the city. According to the Central Pollution Control Board, if the quality gets worse and reaches the "very poor" level, a ban is imposed on the use of diesel generator sets, coal/firewood in hotels and open eateries, parking fee increased 3-4 times, bus and metro services are increased. Also, under the GRAP, media organisations are alerted to advise people with respiratory and cardiac patients to avoid polluted areas and restrict outdoor movement. The Residents Welfare Associations (RWAs) and individual house owners are supposed to provide electric heaters during Winter to security staff to prevent them from burning wood, coal, plastics for warmth. The measures implemented when the level touches "severe" include closing of brick kilns, hot-mix plants, stone crushers, shutting down of the Badarpur power plant and maximising power generation from the existing natural gas-based plants. When the pollution level dips to "severe+", a ban is imposed on the entry of trucks, except those carrying essential commodities, into Delhi, and construction activities stopped. Additionally, the "odd-even" scheme for private vehicles based on licence plate numbers is introduced. Regular physical activity may improve the lung function among smokers, regardless of air pollution levels.